The staff at Sheeler Auto Repair will surpass your expectations with professional and personalized service. 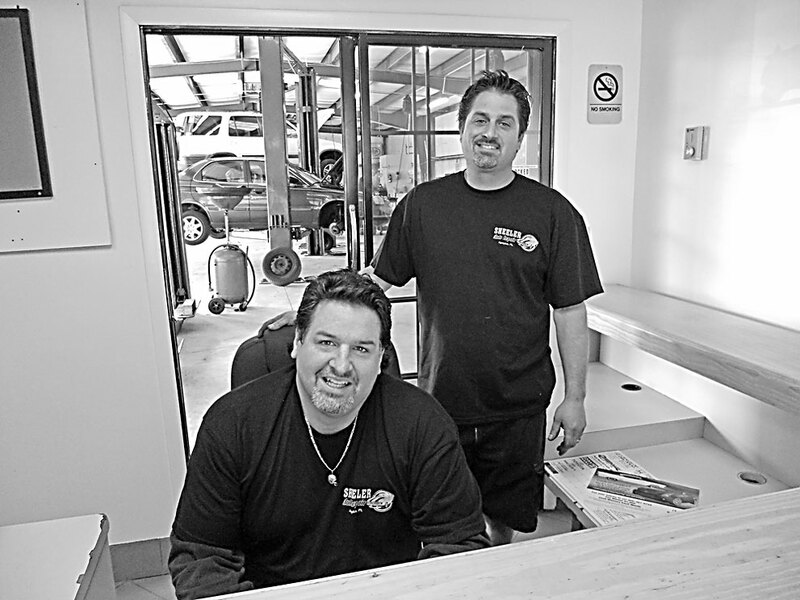 Ready to assist you with all your vehicle maintenance and repairs are, (l-r), co-owners Demetrios and Odysseus Vergos. Everyone who is in need of having their vehicles maintained or repaired wants it to be done by someone who has had a long history of interest in cars and in business. You want someone who loves to work on them and have them running the best they can for you and your family. You want to be able to trust your service department, and know the love and passion of their work will be part of the maintenance or repair of your vehicles. For over 22 years, owners and brothers Demetrios and Odysseus Vergos have been serving the greater Apopka area with honest and dependable auto repair service. They treat each customer as family with respect and integrity. That’s why Sheeler Auto Repair has always been voted one of the best auto repair businesses in the area. When you bring your car in for maintenance or repair, you will deal directly with the owners. No middlemen in between. And, you’ll find no service manager working off bonuses and margins, or being pressured from corporate executives to increase sales at all costs. When it comes to fair and honest service, you don’t need to look any further than this family business. The staff at Sheeler Auto Repair knows that your vehicle is a big part of your family’s everyday routine. And, they understand it’s usually the second biggest investment after your home. These important facts are what makes them go the extra mile for you. Sheeler Auto Repair’s facility is a 6,000 square foot shop that is filled with updated, state-of-art equipment to make sure the job is done right. In today’s age of ever-changing technology, they know the importance of keeping up with the changes to better serve their customers. All work is warranted for one year and with unlimited mileage, whereas most repair shops will offer 90 days labor and six months on parts. They go above and beyond that. They offer customer pick-up and drop-off from home or office. Sheeler Auto Repair is open Monday through Friday, from 8 a.m. to 5 p.m., and they pride themselves on being open all day Saturday, from 8 a.m. to 5 p.m. for the customers who cannot make it in during the workweek. If you choose to wait while they service your vehicle, you’ll find a neat, clean, and air conditioned customer lounge and restroom. There’s always a pot of hot coffee, Direct TV, and vending machines for those who choose to wait for their vehicles. There is also Wi-Fi for customers’ entertainment or to work while you wait. Sheeler Auto Repair offers the fairest pricing in the area, warrants their service, and maintains a history of all customers’ vehicles. You’ll find they will also include recommendations based on mileage and inspections. The staff at Sheeler Auto Repair understands that there are not full service gas stations around like the old days. For single mothers, widows, and people who aren’t physically able to check their air pressure in the tires or fluid levels, don’t hesitate to pull in anytime for a courtesy check, free of charge. They operate under a strict Code of Ethics, and are environmentally friendly. Sheeler Auto Repair invites you to stop by and see the “Sheeler Difference!” They are confident that you will leave with a great impression of how well they can take care of your vehicle. They are conveniently located at 1908 S. Orange Blossom Trail in Apopka, just a short distance past the Super Wal-Mart. They are on the same side of Highway 441 as Wal-Mart and are located directly behind Trans Express. Call Sheeler Auto Repair today at 407-880-5784 to schedule your next maintenance check or repair service.